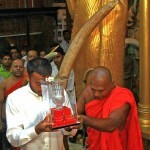 President Mahinda Rajapaksa after an official three-day visit to Bangladesh returned to Sri Lanka with sacred Kesha Dhathu (hair relics) of the Lord Buddha. They have been presented to him by a group of representatives from a temple in Chittagong in Bangladesh. The Bangladeshi Prime Minister Sheikh Hasina in response to a request made by President Mahinda Rajapaksa has released the relics to be brought to Sri Lanka for the 2600th Sambuddhathva Jayanthi exposition. 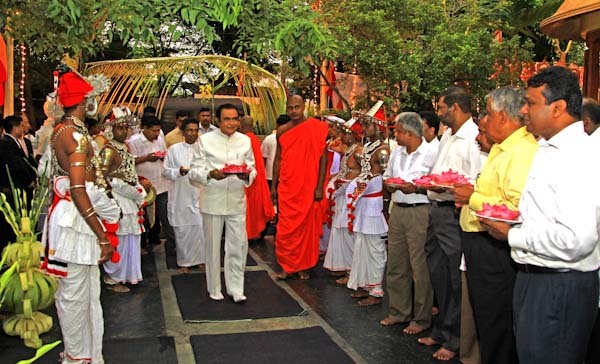 President Rajapaksa handed over the sacred relics to Prime Minister D M Jayaratne at the Airport and a special religious programme was conducted by the Maha sangha headed by the Chief Incumbent of the Hunupitiya Gangaramaya Temple Venerable Galaboda Gnanissara Nayaka thero at the Airport. 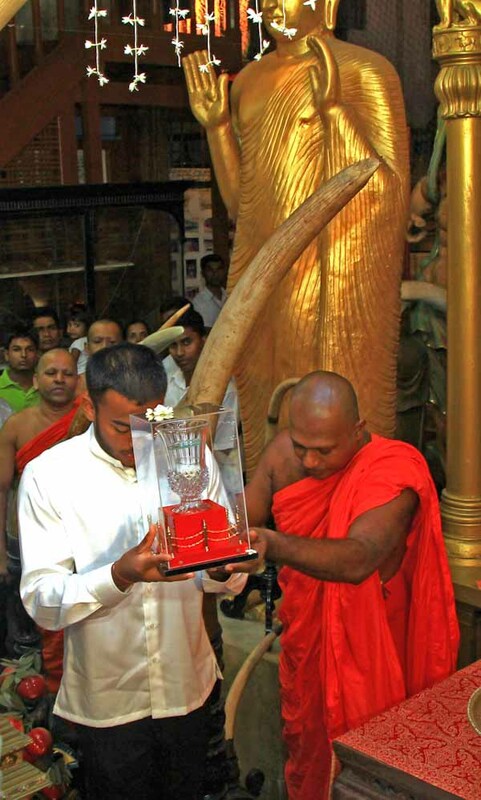 Subsequently, the sacred relics of The Lord Buddha were placed at the Gangaramaya Temple by the President’s son Yoshitha Rajapaksa. Addressing the gathering the chief incumbent of the Viharaya Ven Galabada Gnanissara thero said that these relics have been received by Sri Lanka due to the virtues of the president. The Ven Thero added that all Sri Lankans have the responsibility of establishing a prosperous nation for the benefit of the future generation. The sacred relics have been placed at the Gangaramaya Temple with those relics previously donated by Bangladesh in 2007, and the temple continues to conduct special poojas in reverence. Arrangements have been made for an island wide public exposition of the sacred relics to mark the 2600th Sri Sambuddhathva Jayanthi commemoration, which will enable devotees to worship the sacred hair relics. Therefore, the relics are presently open for public worship and will be taken to Kaluthara bodhiya premises during the Vesak period.